We talk about back pain as the evil of the century , so widespread is this disorder. However, back pain does not mean a particular disease, but a set of symptoms that can have multiple causes, serious or not, acute or chronic, inflammatory or mechanical, etc. This sheet is not intended to list all possible causes of back pain, but rather to offer a summary of the different possible attacks. When the pain is located in the lower back at the level of the lumbar vertebrae. The back pain is the most frequent reached. When the pain affects the neck and cervical vertebrae, see the card on the muscular disorders of the neck . The vast majority of back pain is “common”, that is, it is not related to an underlying serious illness. How many people feel back pain? Back pain is extremely common. According to studies, it is estimated that 80 to 90% of people will have back pain at least once in their lifetime. At some point, about 12 to 33% of the population complains of the back, and low back pain in most cases. Over a period of one year, 22 to 65% of the population is considered to suffer from low back pain. Neck pain is also very common. In France, back pain is the second leading cause of consultation with the general practitioner. They are involved in 7% of work stoppages and are the leading cause of disability before age 45. In Canada, they represent the most common cause of workers compensation 5 . This is a very debilitating public health problem all over the world. Many factors can cause back pain. In 90 to 95% of cases, the origin of pain is not identified and we speak of “common rachialgie” or nonspecific. The pain then, in most cases, lesions in the intervertebral discs or vertebral osteoarthritis, that is to say, wears of the cartilage joints. Neck pain , in particular, is very often related to osteoarthritis. 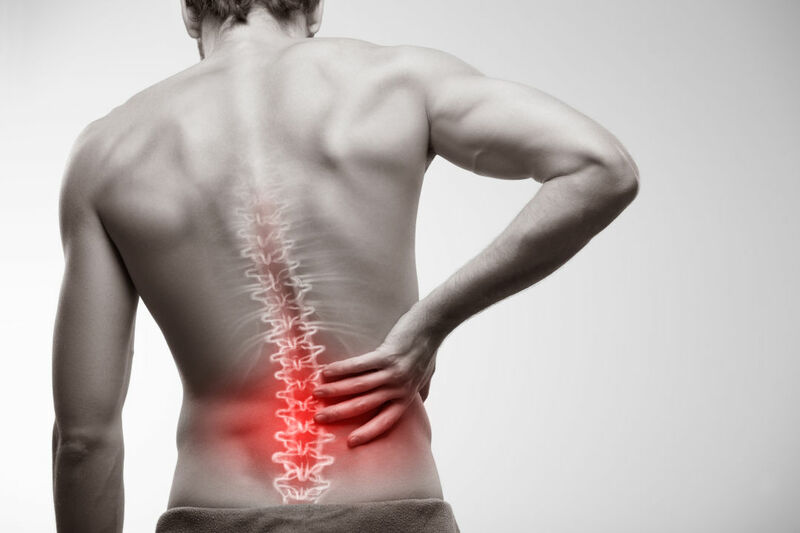 In 5 to 10% of cases, back pain is related to a potentially serious underlying disease, which must be diagnosed early, such as cancer, infection, ankylosing spondylitis, cardiovascular or pulmonary problems, etc. . Since back pain is “nonspecific” in most cases, imaging tests such as x-rays, scans or MRI are not always necessary. Dorsalgia : In addition to the causes listed below, back pain can be potentially related to anything other than a spine problem, especially to a visceral disorder and should prompt consultation. They can thus be the result of a cardiovascular disease (infarction, aneurism of the aorta, dissection of the aorta), of a pulmonary disease, digestive ( gastric or duodenal ulcer , pancreatitis, cancer of the esophagus, stomach or pancreas). Complications and evolution obviously depend on the cause of the pain. When it is a back pain without underlying disease, the pain can be acute (4 to 12 weeks), and resolve in a few days or weeks, or be chronic (when it lasts more than 12 weeks). Weeks). There is a significant risk of “chronicization” of back pain. It is therefore important to consult your doctor quickly to prevent the pain from becoming permanent. However, several tips can help limit this risk . The symptoms of back pain differ depending on the type of back pain and the cause. The pain may be inflammatory or mechanical, sharp or throbbing, localized or diffuse, constant or fluctuating, etc. The intensity of the pain is not proportional to the severity of the injury. It is difficult to give general prevention advice as the possible causes of back pain are numerous. If it is a common back pain, without serious pathology, some lifestyle measures and postures can limit the risk of occurrence and aggravation of pain. More information on back pain and the muscular disorders of the neck to find out more. These tips are also valid for non-specific back pain. The treatment of nonspecific back pain is based on medication, if necessary at the time of painful crises, but especially on non-pharmacological measures (education, bodybuilding and relaxation exercises, massages …). Multidisciplinary programs that include pain management, education and counseling, physical exercise and psychological support are the most effective . In the vast majority of cases, back pain disappears in a few weeks. However, a certain proportion of them become chronic (about 7%). There is then very often a vicious circle: the more one hurts, the less one solicits the back, the weaker the muscles, the less they support the vertebral column, and … the more we ache. Here is an overview of frequently recommended treatments and measures for acute and chronic nonspecific pain. When the pain is intense, several medications can relieve, paracetamol (acetaminophen), an analgesic (pain medication) is recommended in the first place. It is important to effectively treat pain as soon as it appears. – Paracetamol (1 g 3 or 4 times a day maximum) or an upper-tier analgesic if the doctor deems it necessary (codeine, dextropropoxyphene, tramadol, dihydrocodeine …). If necessary, the pain reliever may be combined with a nonsteroidal anti-inflammatory drug (NSAID) and / or a muscle relaxant (benzodiazepine) if the pain is, at least in part, related to muscle contracture. If the pain becomes chronic (more than 12 weeks), the doctor can prescribe analgesics in “background treatment”. Be careful however to self-medication: anti-pain and NSAIDs are not trivial; nor should they be associated without medical advice. In some cases, epidural infiltrations of corticosteroids may be proposed, especially during painful outbreaks associated with sciatica or cruralgia. They reduce inflammation. Finally, tricyclic antidepressants have a pain-relieving effect and may be prescribed for chronic low back pain, especially in cases of depressive syndrome. In case of back pain, bed rest is never advisable (except in acute phase very painful, and not more than a few days in this case). Many studies have shown that prolonged bed rest tends to aggravate the pain, increasing stiffness, decreasing muscle strength, but also fueling fear and creating an avoidance attitude (the person has fear of pain, so she avoids potentially painful gestures, and these become even more so). The osteopathy , the physiotherapy (physical therapy) and massage therapy are effective treatments for back pain, especially if they persist for more than two weeks. Combining manipulations, bodybuilding exercises (paravertebral muscles, abdominals), exercise rehabilitation, and sometimes electrical stimulation, massage, heat, etc., these techniques can relax muscles and improve posture, and prevent the return pain. Some approaches to psychotherapy, such as mind-body approaches, can help to break the cycle of chronic pain. In addition to reducing the intensity of pain, they help to better manage stress, to learn to relax and to have a more positive attitude. The cognitive behavioral therapy is one of the most used approaches. More specifically, some patient education programs specifically target chronic back pain (eg back schools ). These programs help to inform and educate people with back pain, to help them physically remobilize their backs without fear, and to learn how to manage pain by adopting good postures and good hygiene. Lumbar or cervical. Few people with chronic back pain should have an intervention, but it can be offered in cases of pain associated with sciatica or cruralgia, or in cases of abnormalities or malformations accessible to surgery.